1. 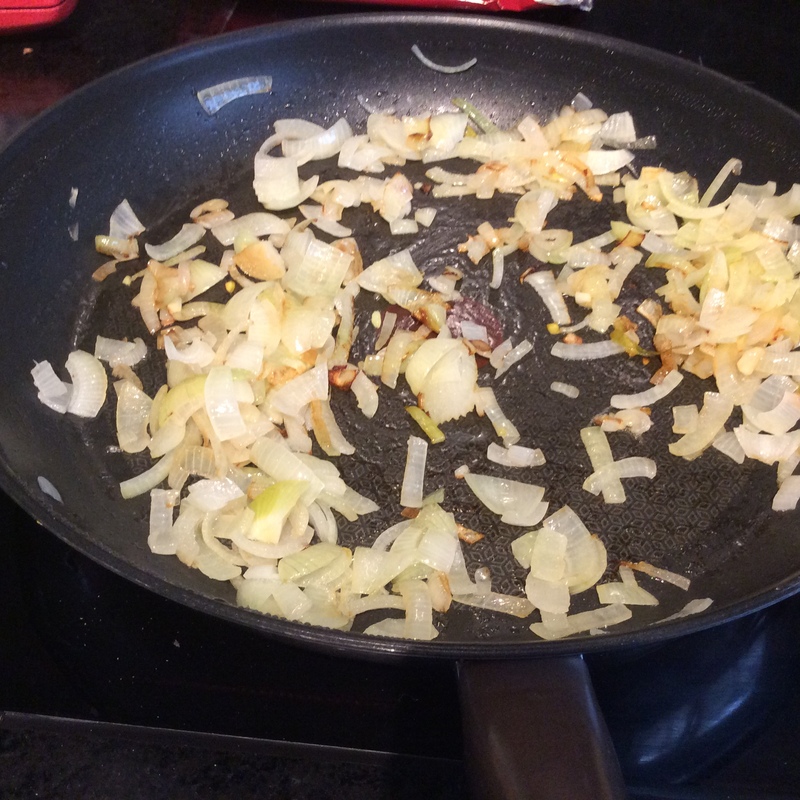 In a frying pan add a couple of tablespoons of oil and gently fry thinly sliced onions until they are soft, roughly 10 minutes. 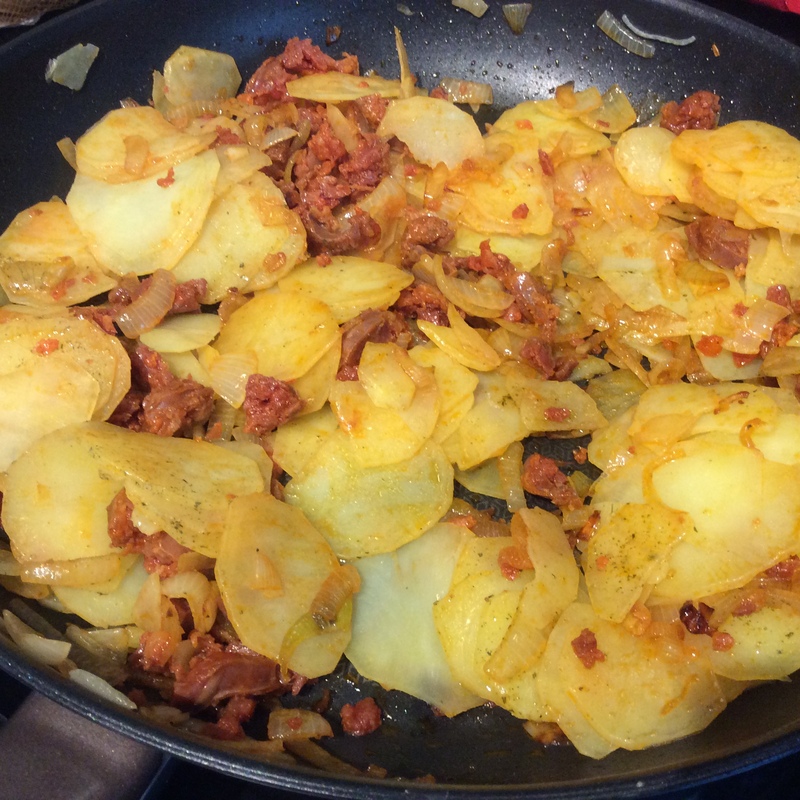 After 5 minutes add some chopped chorizo sausage or sliced red pepper if you want a veggie version. 2. 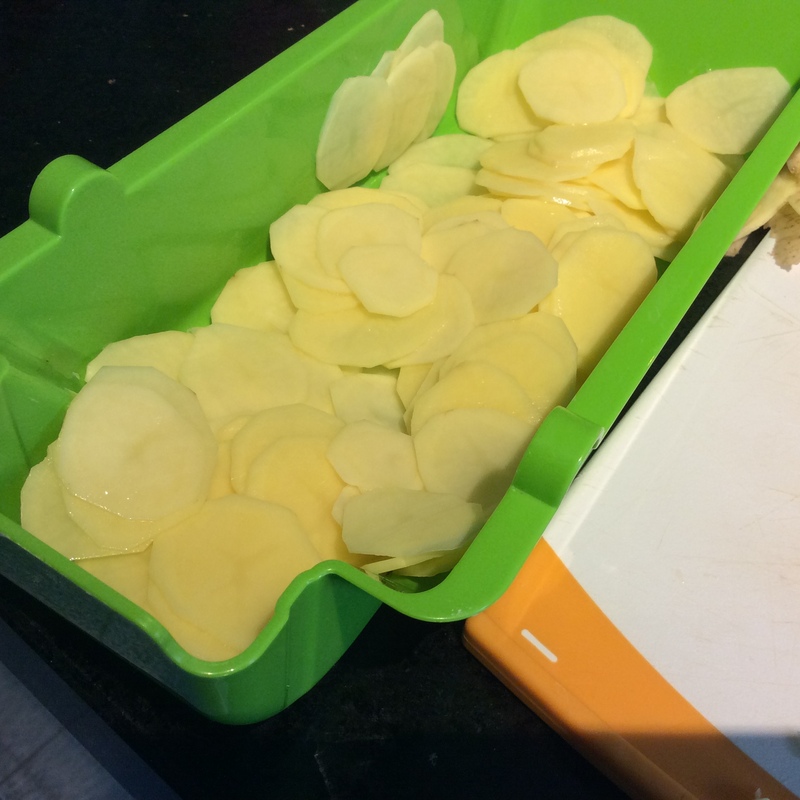 Meanwhile peel the potatoes and thinly slice then. Boil in a sauce pan for 5 minutes or a little longer if they are a bit thicker till they are almost done but still have a bit of bite left. Drain in a colander to try and remove most of the water, you can dry them with kitchen paper or a clean tea towel to remove more water. 4. Add to the softened onions and season with salt and pepper, Stir gently. 5. 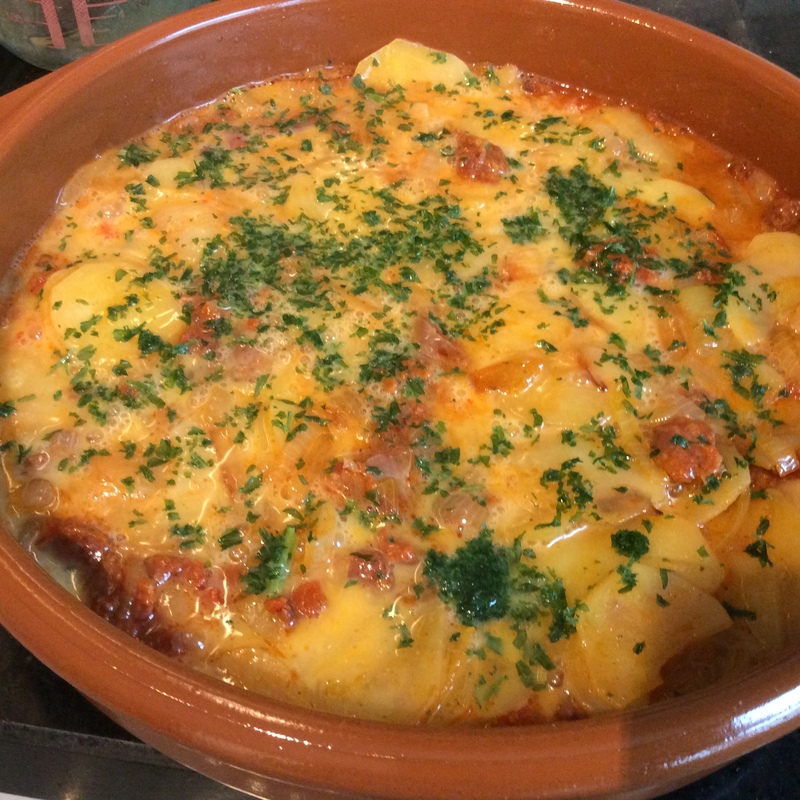 Lightly oil the casserole dish and the onion and potato mixture and spread evenly. 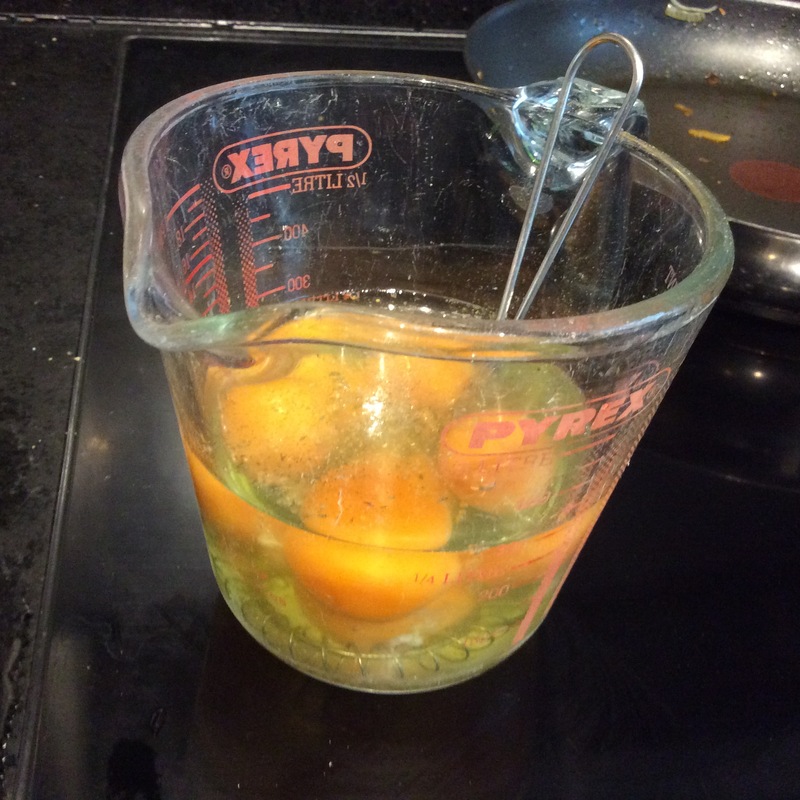 Whisk the eggs in a jug add a little more seasoning. Pour over the mixture and stir gently. 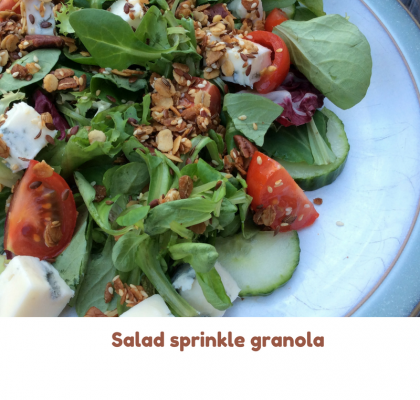 Sprinkle with a little chopped parsley. 6. Bake for 20 minutes or until the middle of the omelette is set. 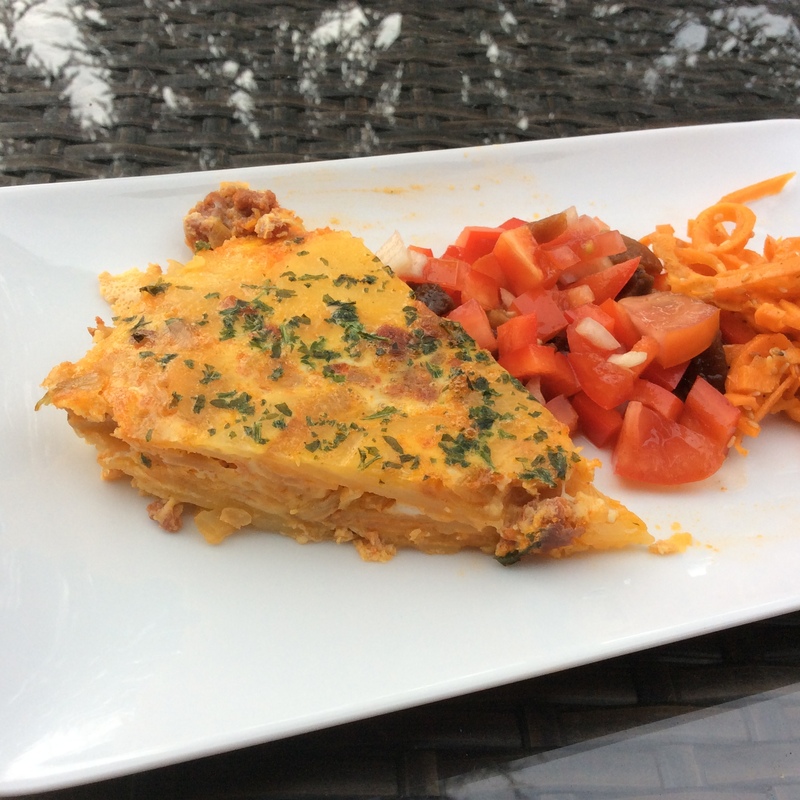 Spanish Omelette is a great Tapas dish. You can serve it hot or cold. 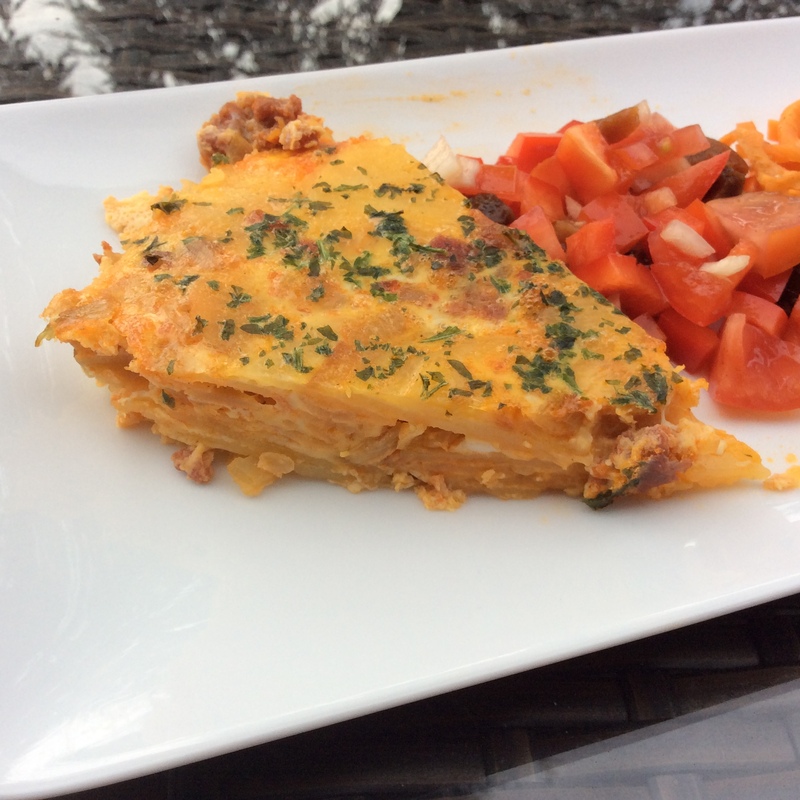 As the weather here as been tropical reaching 39 degrees C on Saturday I haven’t been do a lot of hot meals, this is a great one to serve cold. I like to eat my omelette with salsa and a few olives. 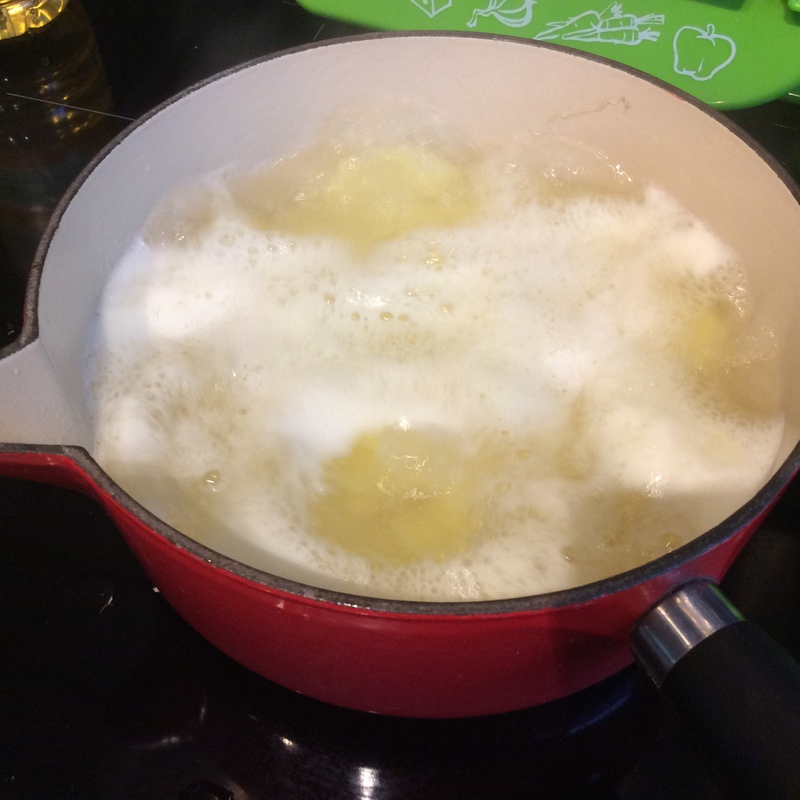 In this easy version you don’t risk burning the omelette on the bottom of the pan and it also a bit quicker than a more traditional version. 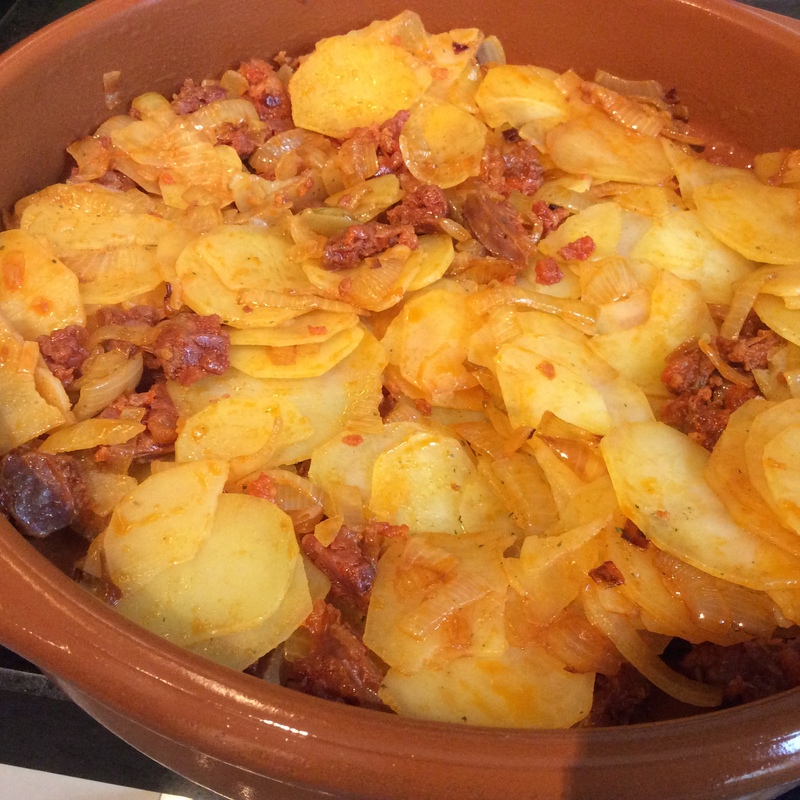 To make it a little bit tastier I add some Spanish Chorizo. If you are going to do an all veggie version add a bit more seasoning and you can add some sliced red pepper as well just before adding the potatoes. 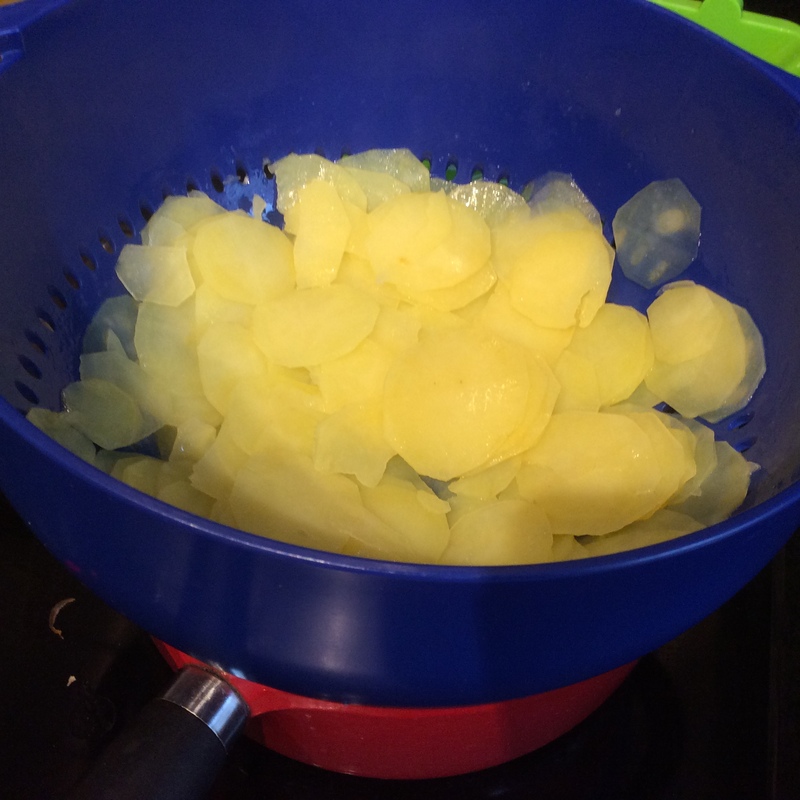 You need to slice the potatoes very thinly. To make this a bit easier I use a mandolin. You need to be very careful you don’t slice your fingers. If you haven’t got one of these and can’t slice manually very thinly you can boil the potatoes for a little bit longer. They don’t need to be completely soft, they still need a bit of bite left to stop them going to mush in the frying pan. Keep testing till they reach the almost done stage. You will a casserole dish to finish the omelette off in the oven. 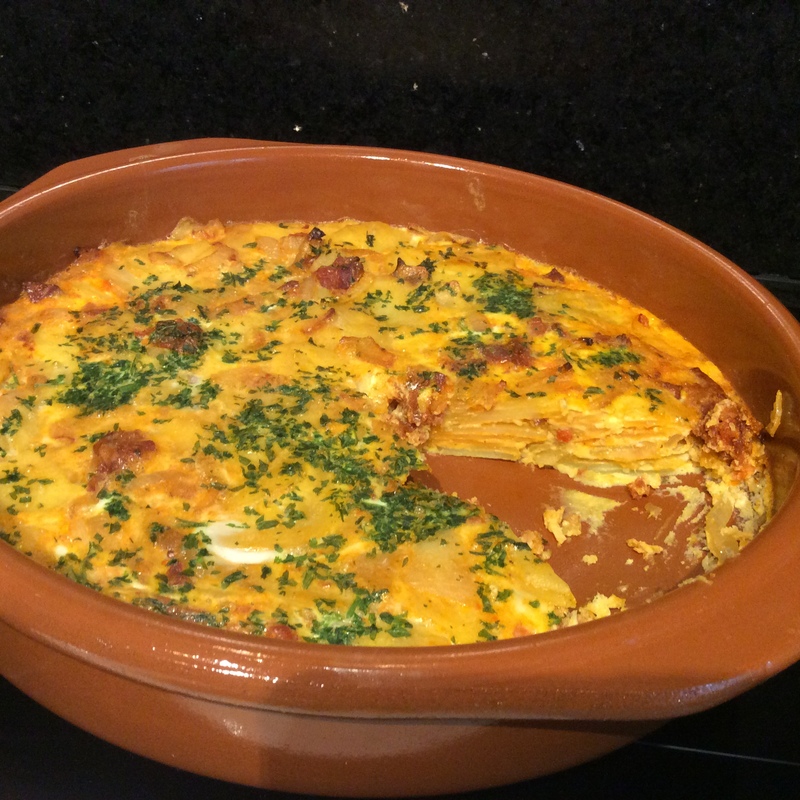 I am lucky enough to have a traditional Spanish Terracotta dish but any any wide flat dish will do. If its a bit smaller your omelette might take a bit longer to cook as it will be thicker and vice versa for a shallower dish. If having a tapas party this dish can be made well in advance and kept in the fridge till you are ready to serve. 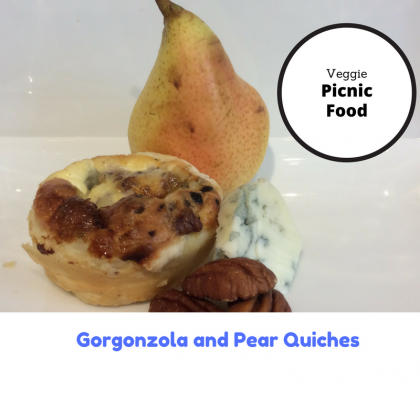 On a picnic it can be cut into smaller pieces and wrapped in cling film. I often take a quarter of a large Spanish Omelette into work as part of a Spanish inspired Bento. 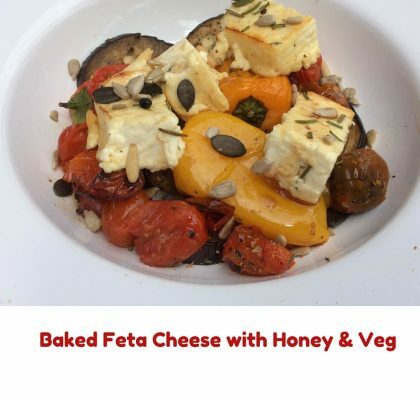 I had this one accompanied with stuffed red peppers, toasted seeds, salsa and olives. 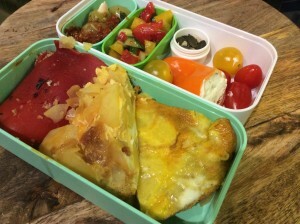 For some other lunch ideas check out by Bento Box page.